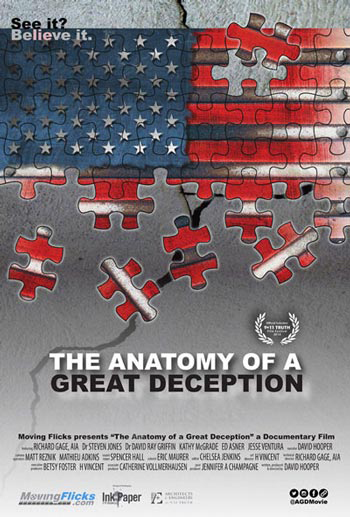 "The Anatomy of a Great Deception"
This September will see the release of the perfect new tool for 9/11 Truth outreach to friends, family, and co-workers: "The Anatomy of a Great Deception," a deeply moving and informative film that follows one man's personal journey of 9/11 discovery. The result is a fast-paced docu-thriller which has become an effective "red pill." Now this "red pill" is at your disposal. 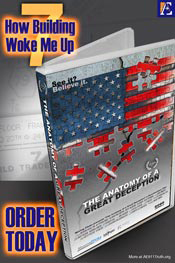 Please join Houston 9/11Truth and be our guest to watch this groundbreaking film. Invite all your friends, family, associates, local architects, engineers, elected representatives to join you. There will be experts with AE911Truth available at the event and online over Skype to answer questions. Without you, we wouldn't exist. You keep us in this Fight for 9/11 Truth and Justice! Order your own copy of this film to hand to your doubting friends — a film that isn't purely technical, a film that touches hearts.